As someone who lessoned and leased a horse in New Jersey for years, I was looking for a new place to ride when I came to Chagrin Falls for a summer internship. I explored riding in the area and found Chagrin Valley Farms. The introductory “evaluation ride” before joining their program sounded intimidating. Luckily, that first ride was not scary, and it was a good investment of time. 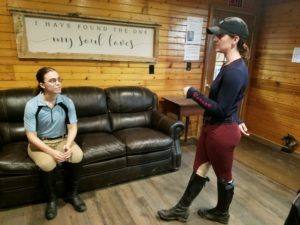 Chagrin Valley Farms’ introductory ride allows the instructor to get to know you as a rider, and for you to get to know the instructor before signing up for more lessons. I worked with instructor Sonja Densmore on the ground and in the saddle. 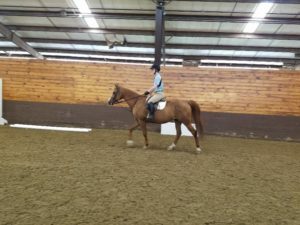 She showed me around the barn and told me about the program, that she wanted to see my level of riding, and what I would work on during lessons. 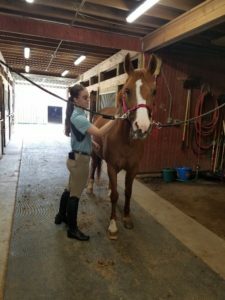 Before my ride, Sonja had me groom and tack up Maggie to gauge how comfortable I was handling a horse. In the arena, everyone’s comfort and safety came first. Sonja always started a transition with “When you’re ready…” before asking me to walk, trot, or canter. I rode at all three gaits (levels of pace), including circles and changes of direction when asked. I also worked Maggie over a ground pole and a cross-rail, as I had prior jumping experience. Depending on riding level, beginner and intermediate riders are asked to do different things during the introduction rides. For instance, beginners might be kept on the lunge line to watch their walking and steering, while the instructor controls the horse. 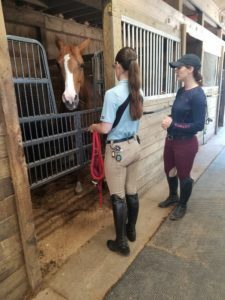 For a rider of any age and skill level, CVF’s introductory ride is a nice way to get familiar with Chagrin Valley Farms’ riding program. 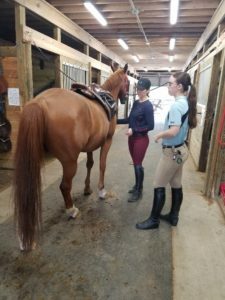 After I did the ride, I continued riding, taking lessons with Sonja and Mandy during my summer stay in Ohio. Before leaving the lounge, Sonja asked me questions about my past riding experience and explained the CVF lesson program to me. 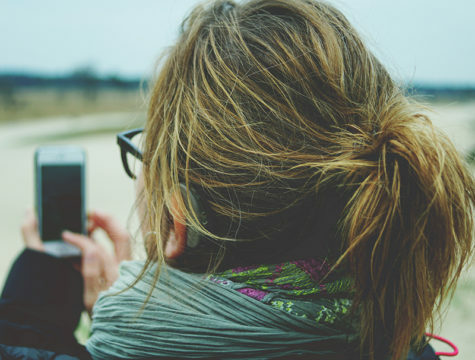 If you’re new to the Farm, your instructor includes a tour of the facility to help you learn your way around. I led Maggie from her stall to the cross-ties to begin grooming and tacking up (below). Because I brought my own saddle, Sonja and I had to check to make sure it fit Maggie. Once we were ready, we headed to the ring for the ride itself.